Amazon Mechanical Turk simply called as MTurk is one of the most widely used web platforms for all people who want to earn money from online part time jobs. Their business model is so simple that pulls everyone to earn more than $1000 per month without any investment. If you are still looking for some genuine methods over the internet to make some extra revenue then Amazon Mechanical Turk is the suitable option for you. It requires no investment from your side but you can make some Rs.5000 weekly from online if you work consistently. Do not start any online work blindly and without knowing their context, how to work, what and where to work? Many people failed to reach success because of not having enough information and knowledge. Also, all people need immediate money overnight. I am sure that is not possible and even if does so it might be a scam for a shorter period. My best advice is to stick to a genuine method, slowly build your foundation by working consistently and start making money. I will explain you every process involved in MTurk including registration. Spend another few minutes of your time to read this article further to get to know about the Amazon Mechanical Turk. 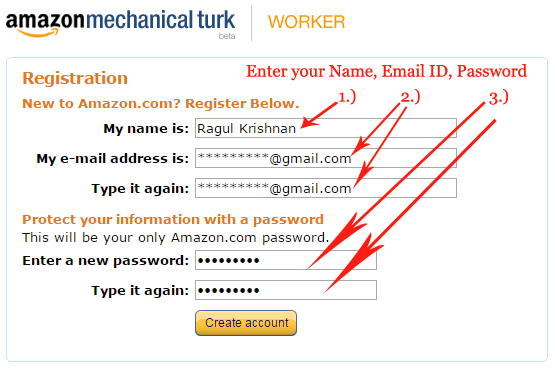 ✓ What is Amazon Mechanical Turk? ✓ What is a Hit? ✓ What is the different between a Worker and Requester? ✓ How do I join MTurk? ✓ How do I work in MTurk? ✓ How do I receive my Payment? Amazon mechanical turk or MTurk is a business place for Crowd Sourcing networks where they offer small micro jobs that can’t be completed by any computers or technologies and thus requiring real human effort to complete. Amazon provides a platform for those businesses to hire people to complete the particular tasks required by the businesses. We can do as part time jobs and can work for any number of businesses at any time. MTurk is a web platform which allows small businesses or website owners to advertise their tasks or micro jobs to be completed with real humans. Still, there are numerous things out there that can be completed effectively only with humans such as Extracting text contents from an image, identifying objects in an image, identifying locations from an image, writing audio contents in a paper, converting text content language from one to another, and still more. Those above tasks might not be completed effectively with just born technology or computers and those require real human efforts to complete. MTurk works on the principle of connecting those small businesses or website owners with people who are looking for online part time jobs. Moreover, those tasks are small and it loads burden for those businesses to hire a dedicated person for that job. That seems too expensive and time-consuming, but it is easier in Amazon Mechanical Turk. Human Intelligent Task, or HIT, is a term referred to tasks or micro jobs offered by the requester to those people. Upon successful completion of HITS (Tasks) worker will get paid. 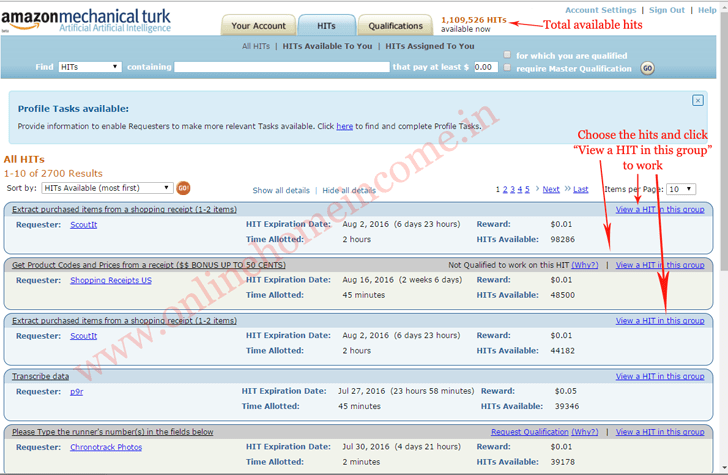 You can find those hits in your account dashboard once you registered an account with MTurk. What is the different between a Worker and Requester? The worker is the person, who joins MTurk to work for money and to complete tasks offered by the requester. The requester is the person, small business owner or website owner who provides tasks over MTurk among thousands of workers who are ready to complete the tasks. How do I join MTurk? Visit www.mturk.com and click on Sign in as work which is seen on the rightmost end of the browser below the address bar. In the next screen, enter your Gmail ID and Choose “No, I am a new customer”. Now press, “Sign in using our secure server”. In the next screen, Complete all details in the form and those includes your Full name, E-mail address, your new Amazon Mechanical Turk account password. Now press “Create Account”. 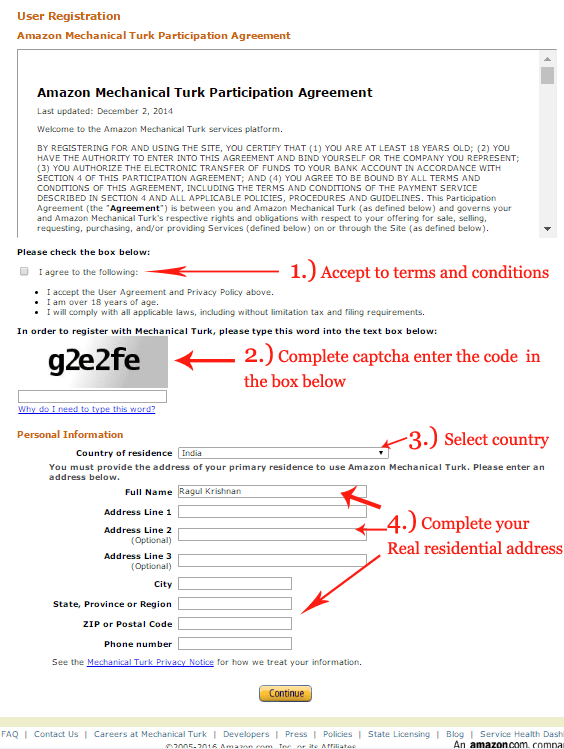 You should need to agree to the terms and conditions of the MTurk. Then complete captcha and select your country as India. Complete further details which include your Residence address, contact number. Please fill all information truly. Now click Continue. In the next screen, you will be displayed a message “we are reviewing your account and it takes 48 hours to complete and then your account will be activated”. However, you can start to work by pressing “View available Hits”. How do I work in MTurk? 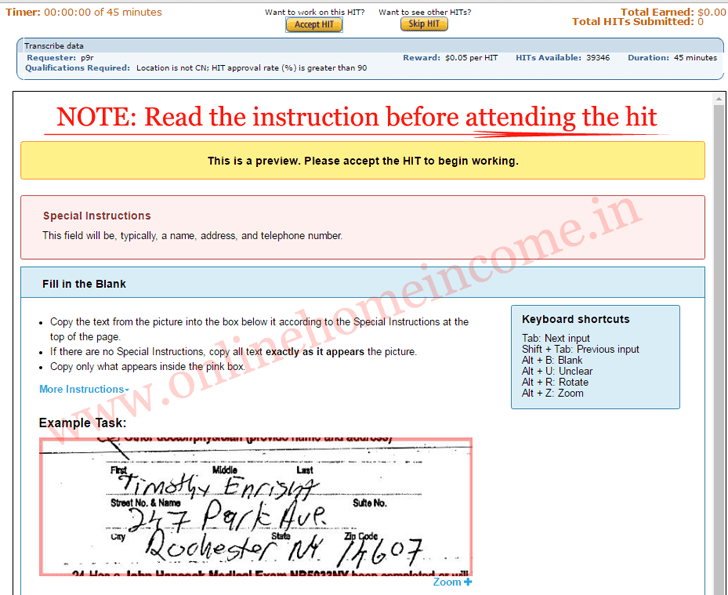 Login to your account and you may see many numbers of hits in your account. Spend enough time to read the heading of the hit and understand. Now click “View a HIT in this group”. You can browse through 1000’s of available hits to work for. Once you click view hit, you will be taken to another screen. Read the instructions and warnings carefully and understand. Now press, “accept Hit” if you feel comfortable with the work. If you are thinking that it is difficult to complete, feel free to Skip Hit. Note: You will be eligible for more hits only if you have more HIT approval rate. So do not accept hits that you could not able to complete. If you do so, you will be banned. You can see how much you earned in your account page. Login to your profile and click “Your account”. There you can see your detailed stat about your account. All your payments will be directly deposited to your bank account provided your date of birth with a scanned copy of your Pan card along with the details of the bank account your money need to be deposited. If you don’t want money, you can transfer your earnings to amazon.com gift card where you can use the same to purchase products from Amazon E-store. Only U.S and India workers can transfer their earnings as real money to their bank account and rest international workers can transfer their earnings to Amazon Gift card. ✓ Do not accept any HITS just for nothing, this is a real work and you need to put your real efforts. ✓ Increase your Hits Approval Rate to near 100% to get more number of available HITS. ✓ More approval rate brings more high paying tasks. ✓ You can work any number of HITS but accept HITS that you feel confident to complete. ✓ You can work at your own available time and program. ✓ You will have to work for 10 continuous days starting from the first day of your first accepted HIT to avoid being your account suspended. Read related post: If you are a college student, then do online part time jobs here. Amazon Mechanical Turk is a really genuine website that pays you truly without any issues. If you are serious in looking for online part time jobs, then this is the best option to choose. Though it requires some knowledge but if you understood the tasks then money will come in to your pocket. If I miss to point out any thing you can notice here.